Besides their shared love for parties, music and event organisation, the two French crews « La Goache Family » and « Atomes » also share the same birth date! That’s why this year it became obvious for us to unite and celebrate 10 years of friendship, challenges, love for music and Dancefloors, in the best possible way we could come-up with ! With the help of the Portuguese tribe « Kunayala », we are more than happy to invite you all from the 2 to 5 august 2018 in north Portugal, at the very first edition of FORA DE TEMPO Festival ! The festival will take place at Barragem do Alto Rabagão, Montalegre, Portugal . ► A Techno Floor by « la Goache Family », bringing you the creme of the French and European underground Techno scene ! ► A Psytrance Floor by « Atomes », offering you a sharp international line-up, from Psygressive to Forest and Darkpsy ! ► A Dub & Bass Floor by « After All Sound System », who join us to celebrate their 15th birthday! ► A Concert Scene by La Famille Walili & Karnival.. with shows, crazy games and various performances! ► A Market Village, an Art gallery, several Camping zones, a Kids zone, Truck & Car parking, Eco-Showers & Toilets ... and many other surprises !!!! The festival will take place in a wonderful location filled with mountains, trees, sand beaches and a beautiful lake…We can’t wait to see you all there family & friends from all over Europe ! 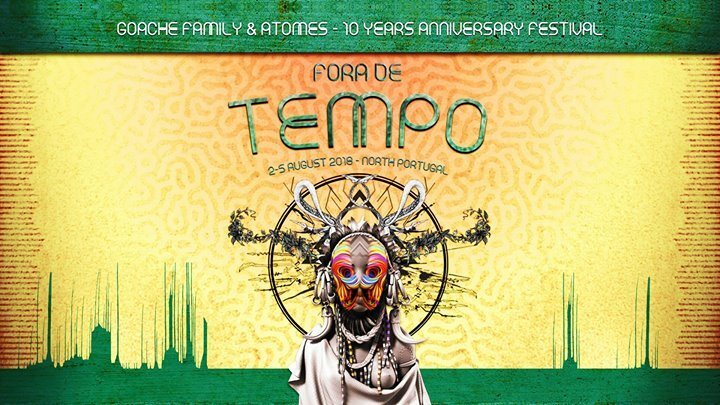 Let’s all meet at the FORA DE TEMPO FESTIVAL !!! Para além do gosto pela festa, música e organização de eventos Atomes e Goache Family também festejam a mesma data de aniversário. Em 2018 celebramos 10 anos de existência, de entreajuda, de viagens e encontros ao serviço da cultura musical alternativa e do Dance Floor. Juntos e apoiados pelo projeto português Kunayala Produções para apresentar Fora de Tempo, festival a decorrer do dia 2 ao dia 5 de Agosto no Norte de Portugal num lugar montanhoso, rodeado de arvores e de um imenso lago. Mais informações serão reveladas. ► Techno stage com uma programa musical proposto pela Goache family e cuja aposta são os artistas europeus. ► Psytrance stage cujo programa musical será proposto pela associação Atomes que aposta na musica arquitetada pelos estilos psygressive, dark e forest. ► Dub & Bass stage orquestrado pela equipa After All Sound System. ► Concertos, artes do circo, artes populares e outras performances sobre a alçada do colectivo Grosse Entube. As comodidades de base (estacionamento para carros e camiões, duches, etc) serão intencionalmente organizadas e concebidas de maneira eco responsável. Fora de Tempo um Festival eclético e sem fronteiras de qualidade e de descoberta cujos ingredientes principais serão a Convivialidade, Diversidade, e GROOVE. En plus de partager l'amour de la fête, de la musique et de l'organisation d'événements, La Goache Family et Atomes ont également la même date d’anniversaire! Cette année, il nous paraissait donc évident de nous réunir pour fêter ensemble 10 ans d’entraide, de voyages et de rencontres, toujours au service des cultures alternatives et du DANCE FLOOR! Associés à la tribe portugaise de Kunayala, nous nous installerons donc du 2 au 5 août dans le Nord du Portugal pour donner naissance à la première édition du festival FORA DE TEMPO! Le festival prendra place dans un lieu magnifique (pour l’instant tenu secret), montagneux et arboré, au bord d'un vaste lac. ► une scène techno programmée par la Goache Family, mettant à l’honneur les artistes de la scène underground française et européenne! ► une scène psytrance programmée par Atomes, au line up pointu et international, allant de la psygressive à la dark, en passant par la forest! ► une scène Dub & Bass orchestrée par la team After All Sound System, qui se joint à nous pour fêter ses 15 ans! ► une scène concert, des spectacles, des jeux forains et bien d'autres performances, proposés par le collectif déjanté de La Grosse Entube (Collectif des Gueux, La Famille Walili, Karnival...)! Stands, camping, kid zone et de nombreuses surprises, ainsi que toutes les commodités nécessaires (parking voitures, parking camions, douches etc.) seront bien sûr présents sur place et réalisés selon une démarche éco-responsable. La Goache Family, Atomes et Kunayala ont hâte de vous accueillir pour FORA DE TEMPO, fidèles à l'esprit qu'ils partagent : une programmation éclectique de qualité et de découverte, la convivialité, la diversité, l'échange, et le GROOVE !!! There will be buses that will depart the 02 august from Porto Campanhã Railway Station at 13:00 PM with a first stop at Airport Francisco Sá Carneiro (around 30 min max after departure) and going straight to the Festival Gates. A Fora de tempo Staff Member will be there to guide you to the Bus. There were be buses that will depart the 06 august from festival site at 10:00 AM with a stop at Airport Francisco Sá Carneiro and then Porto Campanhã Railway Station. A Fora de tempo Staff Member will be there to guide you to the Bus. Stop at PISOES and from then you can either hitchhike to Festival gates or arrange something with Fora Groovers on the Car sharing Group ! As we really want to keep a family vibe for the Festival, we have a maximum gauge at 4000 happy people on site! So be prepared to grab your presale quickly before it’s too late! IMPORTANT : Beware that tickets are linked to your name so you will be asked to show your ID card at the gate of the Festival! If you can't come anymore and want to sell your ticket, you need to send an email to foradetempo.prod@gmail.com with "TICKET NAME CHANGE" as a mail title, with the complete name and mail of the new ticket owner and the original ticket attached. At the gate : 70 euros CASH ONLY! Please be careful as after the 15th of July it will not be possible to sell your tickets or change your tickets names anymore! This is an all ages event however anyone under 18 years old must be accompanied by legal tutor with proper documentation. No exceptions allowed. The entrance is free for children under 13 yeas old if accompanied by their parents. Parents that come with their children under 13 must send an email to foradetempo.prod@gmail.com to « register » their kids. ► Want to be volunteer ? Welcome to the first Fora de Tempo volunteers experience ! The application is open for people who are willing to help us before or/and during the Festival. The main thing we ask for to all volunteers is a full capacity to truly invest and work with others as a team. We are an underground event and we expect volunteers to be able of creativity and own initiative as well as respect and positivism. Keep in mind that we ask all volunteers to buy their ticket that works as a deposit and will be refunded after completion of all shifts! ♦ TOTAL FIRE BAN on all the Festival site! Portugal suffered enough from fire lately so we won’t allow any fire of any kind. For those who need, some eco-barbecues will be dispatched on site but everything else is not allowed! ♦ Dogs will be allowed ONLY on the parking zones but not on the festival site! in 0.066 seconds server time.